Life is good, says popular artisan baker and blogger Colyn Serfontein. It is Friday and he’s got his sourdough for pizza in the fridge. He’s helped a man with his sourdough starter and he’s helped a woman in Oman who wants to break bread à la Colyn. Admittedly, it’s been one heck of a ride getting to this point. 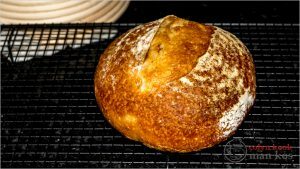 “You have no idea of the myths and fables I had to contend with in order to get my sourdough bread just right,” Colyn says. I am going to assume that you followed my guide in growing your own starter (STARTER) and you rigidly stuck to the 100% hydration feeding plan. In other words your starter is 50:50 flour and water. 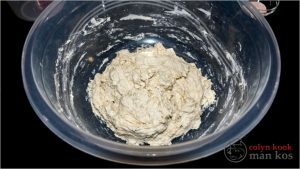 I am also going to assume you have read my article in using your starter (USE) and you know exactly what to do to prepare your starter for baking. You will need 200 gr of your starter. You need to stick to the grams in this guide. We will make a bread dough from 500 gr flour and 335 gr water. This is a 67% hydration and gives you a very manageable dough. 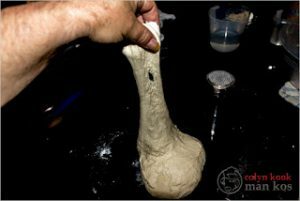 Do not be tempted to go too soft in the beginning because it takes some skill to handle very wet dough and that is an article for another day. 3. 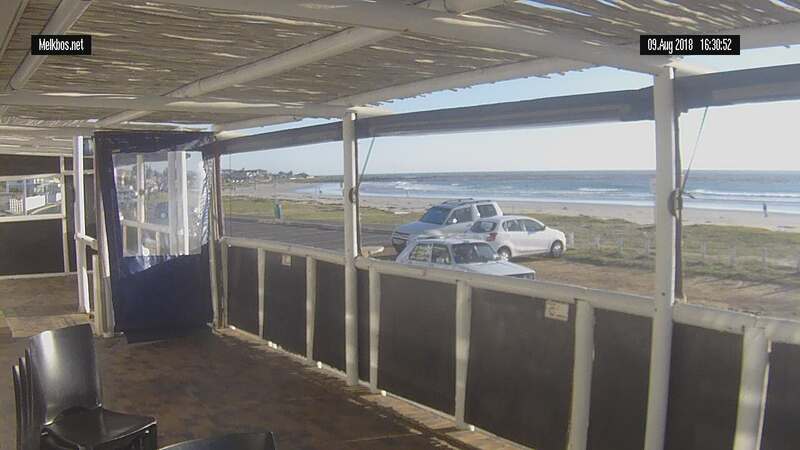 Salt – 11 gr. 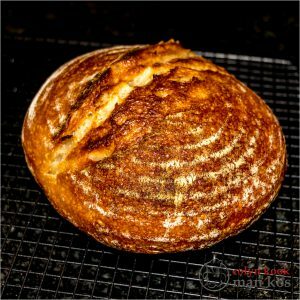 I know this is not the correct way to present a bread recipe but we are beginners and I am making it as easy as possible to bake a good bread. And that is all you need to make a very special bread … Flour, water, salt and natural yeast. Now my advice to you is to weigh all these elements before you start anything. 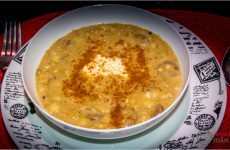 Get your bowl ready and have a small dish with around 4 heaped tablespoons of flour in. Keep that on the side. Dust your work surface and adjust your dough if it is required. I will now assume that you have everything measured out. Your bowl is ready and you have a lid for it or cling wrap to cover it. Some people use a tea towel … I don’t like it because in warm climates a skin will form on your dough. PS … DO NOT ADD THE SALT. Agitate the flour with a whisk or you fingers to get the flour aerated and loose. This helps the initial mixing and it is good for the yeast. Form a well in the middle of the flour and pour the Starter on. Take your time and scrape as much out of the container as you can. I usually measure my starter in a measuring cup. 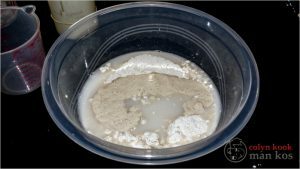 Now pour some of your water into the starter container and rinse it well to collect as much of the residual starter as your can. Remember it is your yeast and every drop has life in it. Now pour this rinse water in your bowl plus the balance of the water. 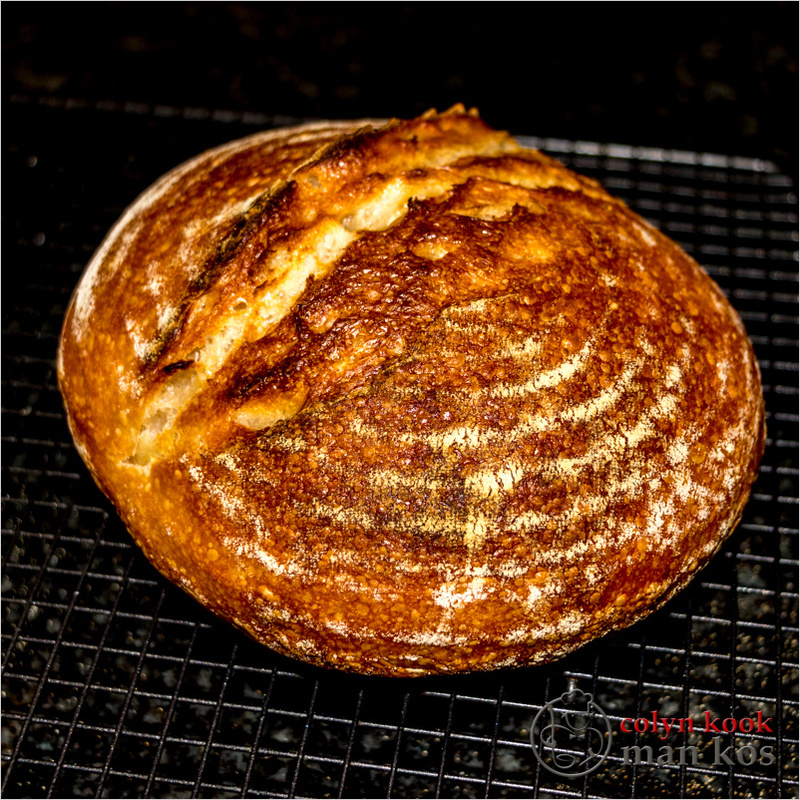 I use a big wooden spoon to mix and bring the dough into a manageable consistency. 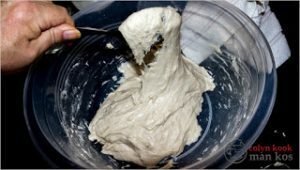 Switch from the spoon to your hand and scrape and roll the dough till it is mixed well and you have picked up all the flour in the bowl. You don’t knead it seriously; just gather and mix. Work with your fingers and press with the heel of your hand. Use a metal spoon to scrape your hand as clean as possible and press the pieces into the dough ball. That is it for now … cover that bowl and let is stand for 60 minutes. This is the AUTOLYSE Phase. During this phase the “magic” will begin and you will be intrigued at what you will see in Phase 2. Open your dough … and have a good look. That shaggy ball has now collapsed and spread over the bottom of your bowl, the surface should look shiny. Now comes the part where you actually need video but I will try my best to describe the process in words. You are standing at your workbench with the bowl in front of you. Press the dough down gently with your fingers to create some indentations in it. Now sprinkle the salt over the dough. Dip your fingers in lukewarm water and loosen the dough at the 12 o’ clock position. 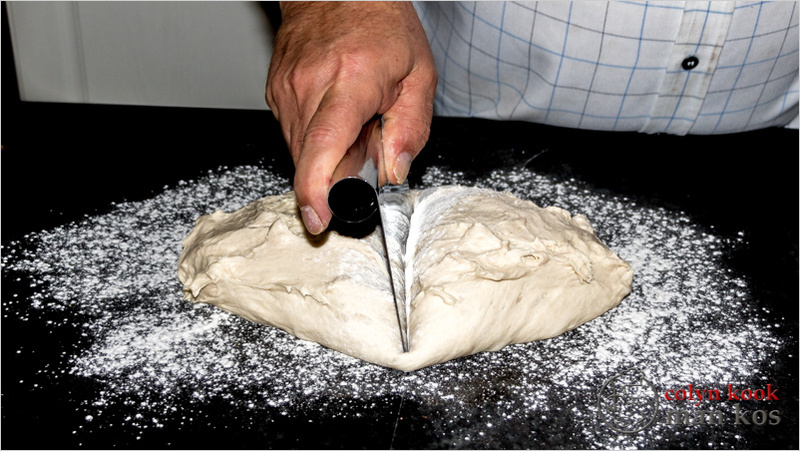 Work your hand in under the dough and now very gently lift and stretch upward. Do not tear it and fold it over to the 6 o’clock position … closest to your belly. 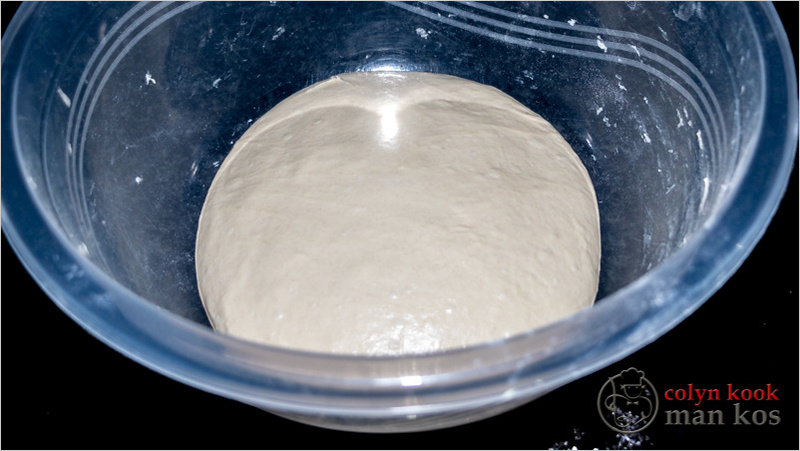 Take a moment and look at that dough … you will notice that it can already stretch remarkably … this is part of the “magic” … the gluten is already developing without kneading … developing naturally. Continue with the Stretch and Fold (S&F) on each quarter … total of 4 folds. 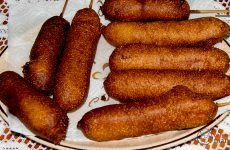 Now dip your hand in the water and start pinching that dough from one side as if you want to separate small balls. After one pass the dough should look like string of beads, well roughly, and with a good imagination. Inch Process is discussed HERE. Take one end and fold it over to the other and pinch again. Feel free to wet your fingers if the dough is too sticky. Now comes the phase where experience will be your biggest ally. Percentages will now fly out of the window. You need to work this dough to end up with a ball that is soft but hold its shape and can stretch well without tearing. You are going to work the dough to develop the gluten and you are going to add flour to get the consistency right. If you have followed my guide the chances of a too dry dough are extremely slim. But should it happen just dip your fingers in lukewarm water as your work the dough. 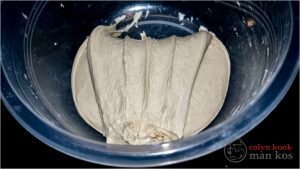 Now comes the kneading … if that dough is too sticky sprinkle some flour over it en work it against the side of the bowl in circular motion, adding flour to get to a manageable consistency. 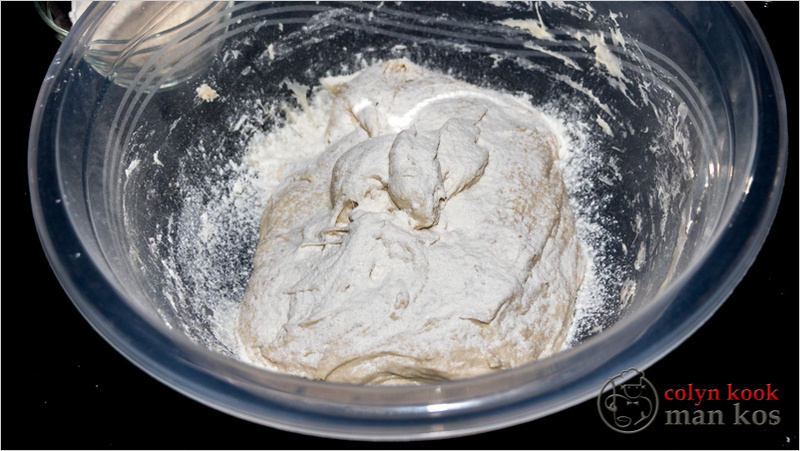 As soon as the dough is manageable … dust your work bench with flour and tip the dough out onto it. 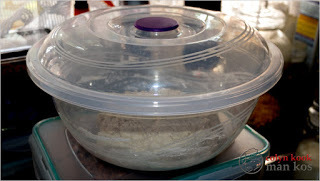 Now you need to knead the dough well … it takes around 8 minutes. Kneading styles differ and each person develops his or her own style. The main thing is that you need to press and stretch the dough. 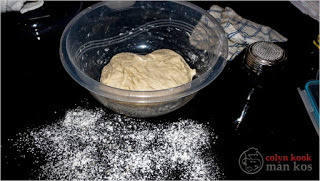 Add little bits of flour until your dough no longer sticks to your hand or the workbench. Beginning to stretch and fold. 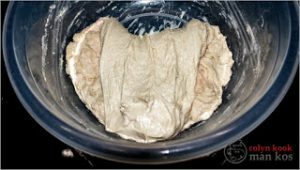 You want to be able to stretch a piece of dough so that it becomes almost translucent before it tears. Fold and form into a tight ball with a smooth stretched tight surface. Place back into the bowl and cover. Set your timer for 30 minutes. 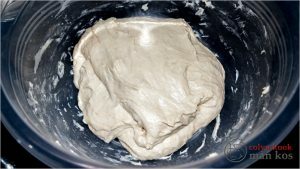 During this phase you will Stretch and Fold the dough on all four quarters every 30 minutes and do it 3 times. After the 3rd time you need to leave the dough alone for 2 to 3 hours or so, until it has risen to between 2x and 3x its original volume. Remember this is a long fermentation process and things do not happen fast. This is now the Bulk Fermentation phase. This process can take 5 to 6 hours long, depending on the humidity and temperature in your kitchen. This is now the Splitting and Shaping phase and it can be very confusing as well as frustrating. I suggest that if you are not a bread maker with reasonable experience, you watch some videos on YouTube about this phase. Tip your dough onto a lightly floured work space. Decide on the size of your final bread and split the dough with a dough scraper or sharp knife. With this size of dough, I would suggest that for your first time you split it in half. That gives you two decent size loaves and you can bake one after the other if you want to experiment with your oven and baking method. Once you have divided your dough, fold and shape it loosely and leave on the bench for 10 minutes. This is called Bench rest. It gives the dough a chance to relax after the dividing. 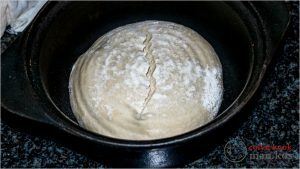 This is a very nice stable dough and you have the choice to bake free form on a sheet, moulded into a traditional loaf pan or in Dutch Oven (DO) … DO refers to the baking of the bread in a pot with a lid. Usually cast iron but ceramic or glass is also used. I am going to assume that you will bake free form on a sheet pan. Your most important mission is to shape the dough in the form you want, round or long. 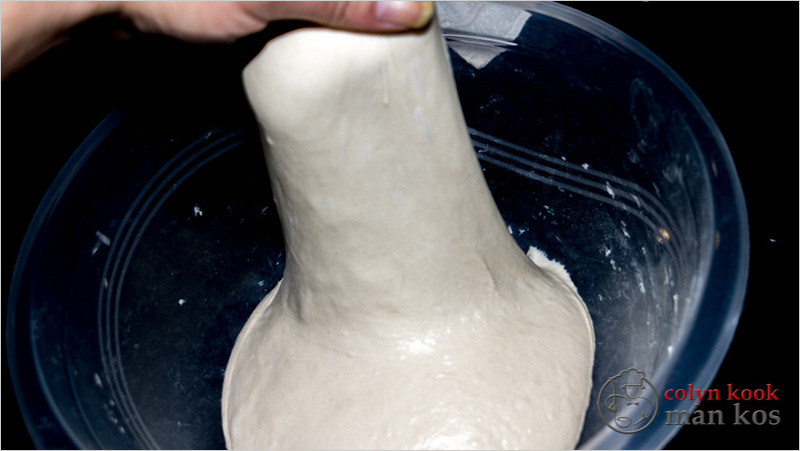 Then you fold the dough into itself to stretch the top surface nice and tight. Preparing for baking in a pot. Dust you sheet pan with flour and semolina if you have it or cornmeal. (Mieliemeel) … this will prevent it from sticking to the pan. Place the shaved dough on the sheet and cover loosely with plastic to prevent drying out. You are now in the final proof phase. This phase of final proofing is between 30 minutes and one hour, depending on temperature and humidity. Now is the time to switch your oven on, 230 C is what I aim for. My oven takes around 20 minutes to reach that temperature. By the time the oven is ready the dough should also be ready. Keep an eye on the dough. You want it to rise to 1 and 1/2 times its original size. DO not over proof now because it might fall flat when you place it in the oven and have no power left to rise again in the oven. This is the final stage. 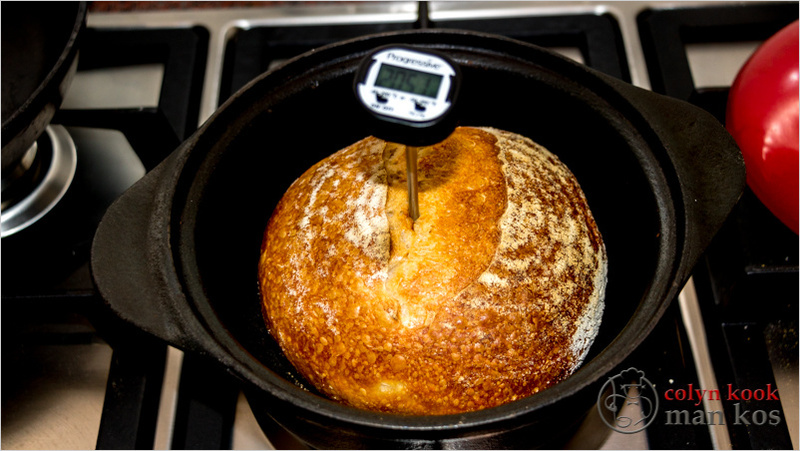 Your oven should be ready at as close to 230 C as you can get. Your dough has puffed up nicely. 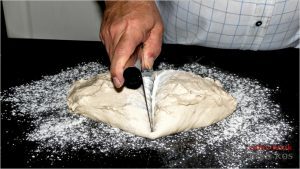 Now you can get creative but it is all for the show … spray the bread lightly with your spray bottle of water, slash a slit into the top of your dough with a very sharp blade. Do this by holding the blade at a slight angle. 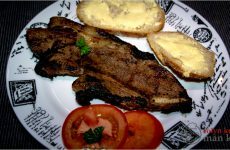 You want the slit to go slightly at an angle in under the top, and not a straight slit, as if you want to remove the guts from the bread. Almost as if you want to peel a piece of the top off. Or you can leave the slashing out … it is all for appearance. Later, when you are more experienced, you will play around with scoring. Dust the top of the loaf with your flour-filled shaker and put it into the oven. Be careful not to slam the pan because that will let your loaf deflate. Close the oven door for 30 seconds and then open slightly and spray around 10 squirts of water into that hot oven. Do not be shy. The more the better. Close the door … set your timer for 10 minutes and relax. I usually use this time to clean up and to get the bench ready for when the bread comes out. You should get the aroma of baking bread soon. When the 10 minutes are up, open the door slightly … be VERY CAREFUL … a lot of steam could escape. Spray a few more squirts into that oven … the spraying is what builds the crust. Set your timer for 20 minutes. You now need to keep an eye on that bread. If you see it go very brown at around 15 minutes of total baking time, turn you oven down to 210 C.
The bread might now go through some serious or slight changes in shape. 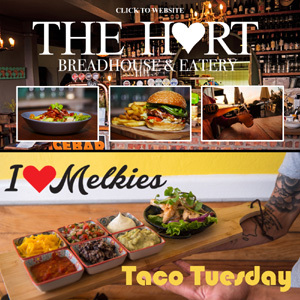 Everything depends on the strength of the yeast and the proofing. DO not panic …. Everything is now out of your hands. At around 25 minutes total baking time the bread should be ready. The time will vary from oven to oven and you need to get familiar with your oven. Fan-driven ovens are hotter than normal ovens and you need to adjust for that. I use a fan-driven oven. If you bake in a pot … be sure to remove the lid after 15 minutes. Take the bread out of the oven when it looks ready. You want a good dark crust. Pick the loaf up with a tea towel and knock the bottom … it should sound hollow, if not … back into the oven for 5 more minutes. Lately I use a probe thermometer and measure the internal temperature. 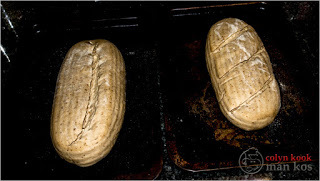 You want it between 196 F and 206 F.
Now you admire your bread while it sits on a cooling rack. The general rule is that you should not slice the bread before it has cooled down for at least the same period of time that it was in the oven. If you cut the bread too soon you may find that you are compressing the hot dough and spoil the crumb and texture of the slice. You have spent hours to get here; be patient. Admire your creation and talk to it. Take some photos… next time you are going to better equipped and you will surely make some adjustments. 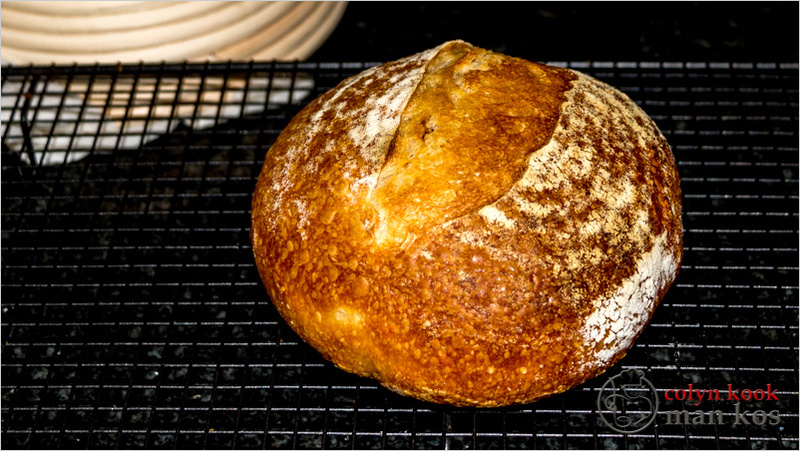 Well, that is it … your sourdough bread is ready… Get out the fresh butter and sink your teeth into it. If everything went well bread will never be the same again for you. This guide was written based on my personal experience and I can assure you that for every step I have described, you will find dozens of pieces on the web where it is refuted, denied or rejected. That is unfortunately the nature of the sourdough beast. 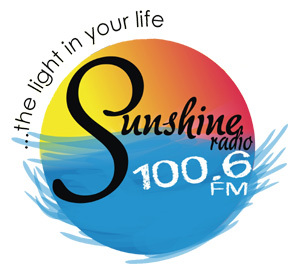 The most important part is to understand the processes and familiarise yourself with them. Then broaden your knowledge and experiment and get innovative. 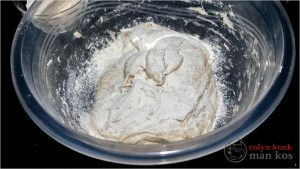 No matter what is said or written the basics are simply … water, flour, salt and yeast … and depending on the relationship and handling of the dough you will get a wide variety of possible outcomes. My mission is to encourage people to bake their own bread and do it by using the long fermentation and natural yeast way … This is how our ancestors did it and they did not suffer from all the modern carbohydrate related ailments. Enjoy your baking and cooking until I write another story.